Drain fruit well. Add orange juice to reserved juice to make 3-cups liquid. 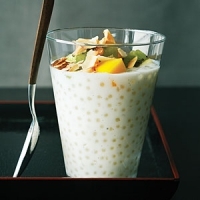 Cook with tapioca until thick. Cool. Fold in fruit. Add bananas just before serving. Recipe categories: Desserts, Puddings and mousses, Fruit.